Yesterday morning (very early! 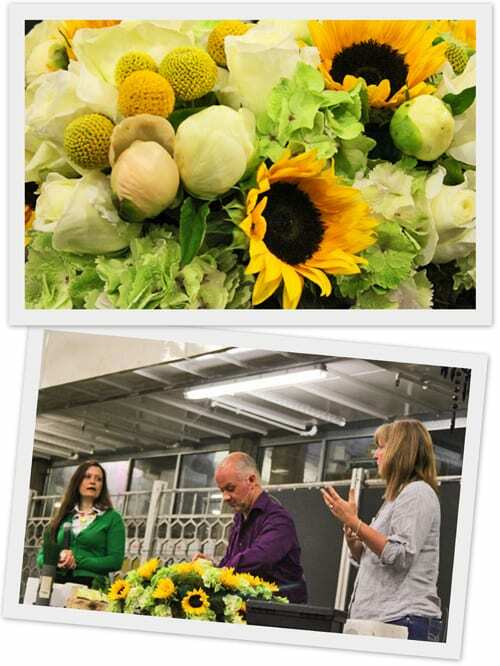 ), I attended a special Summer Wedding Flowers event for florists at New Covent Garden Flower Market in London, hosted by Helen Evans and Liz Anderson of the New Covent Garden Market Authority. 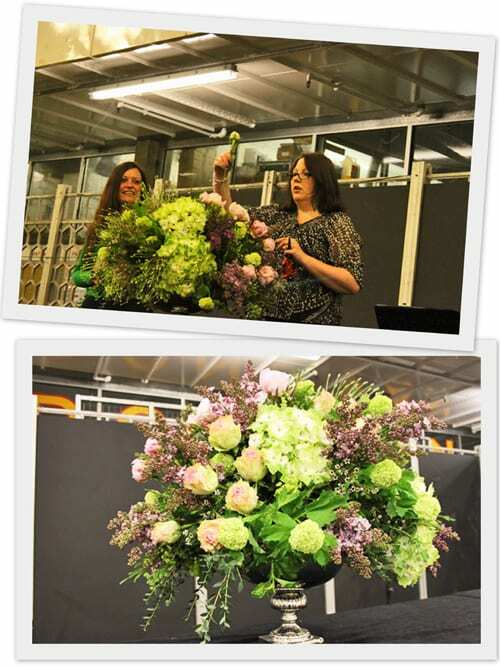 Not only were there floral demonstrations by top London florists, but also a marketing presentation and an expert panel with wedding industry experts. Marianne Cowdrey from World Wide Florist Marketing started off the morning with a fantastic presentation about marketing to brides-to-be. Her advice included embracing social media and setting up a Facebook fan page, plus submitting articles to Ezine Articles to help with search engine ranking. Next, florist Karen Woolven created a stunning floral arrangement with a country garden look, as shown in the images above and below. It would be a perfect arrangement for a summer wedding in a stately home. She started by ‘greening up’ a silver rose bowl from sundry supplier, C Best, with parvifolia eucalyptus and alchemilla mollis. 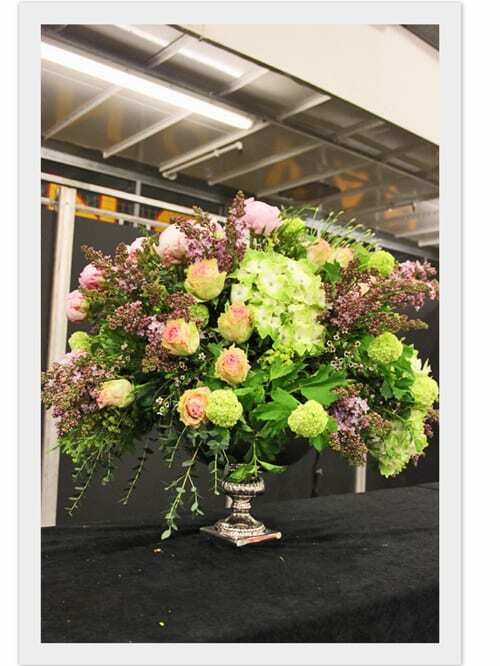 Then she added waxflower, guelder rose, alliums, lilac, hydrangea, peonies and Esperance roses. 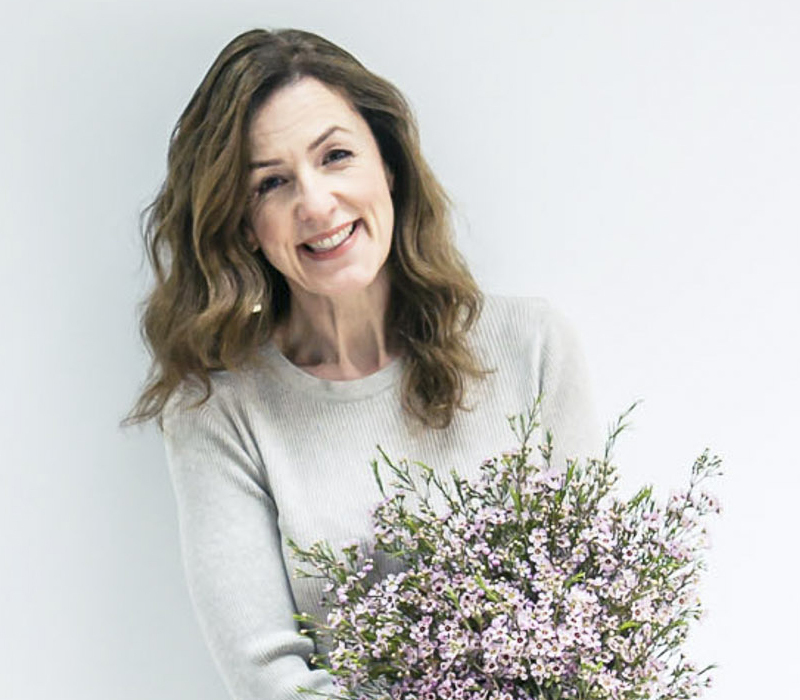 Karen’s career has spanned working at the Grosvenor House Hotel, to assisting Simon Lycett and Paul Thomas, to now running her own floristry business, Karen Woolven Floral Design in London. She recently was involved with ‘the’ royal wedding! She helped with floral arrangements for the pre-wedding party at the Mandarin Oriental Hotel. The venue was decorated with big urns of English country roses, rhododendron, guelder rose, sorbus, beech and birch with a white/cream colour theme. Andrea Caldecott then chaired an Expert Wedding Panel with Ashley Roberts (Event Director of The National Wedding Show), Kelly Chandler (The Bespoke Wedding Company), Alison Lovett (Style Editor at Wedding Flowers Magazine) and Debi Simpson (Style Assistant at Wedding Flowers Magazine). It was interesting to hear that wedding trends seem to be influenced not only by fashion, but also by popular culture. For example, recently the film, Black Swan, has prompted ballet-inspired weddings. Vintage is still very much ‘in’. Plus colour blocking and grouping stems in small vases is popular. And the majority of brides tend to be opting for a timeless classic look for their wedding flowers. The general opinion was that some brides are eco-friendly, but the majority ‘want to have the flowers they really want’. So although a lovely idea, if the flowers they have set their heart on aren’t available from UK suppliers when they’re getting married as they’re not in season, then brides are happy for them to come from abroad. The topic of DIY brides was raised. Alison said that some brides are trying to save money and are keen to do as much as they can for their wedding themselves. For example, by making the favours. When it comes to wedding flowers, some brides initially decide to ask a florist to only arrange their bouquet and the buttonholes, and say that they’re going to do the table arrangements and decorate the venue. However, nearer to the wedding day, it’s very common for them to ask the florist to take over all the floral decorations, when they realise how much skill and time is involved. It was also discussed that some budget-conscious brides are prepared to include cheaper flowers, such as standard carnations, in their wedding floral arrangements and mix them with more expensive blooms. The buzz words for the event yesterday were blogging and tweeting. And Alison recommended that, if they didn’t already have one, that florists should start a blog to showcase their work, as blogging has really taken off in a big way. She said that Wedding Flowers Magazine Art Editor, Julia Ford, has a blog called Modern Photographic which Alison recommended the florists took a look at. Plus, American wedding blog, Style Me Pretty was praised for floral inspiration. There was then a fantastic demonstration by Simon Nickell and Victoria Taberer-Bond of Euphoric Flowers. They created a low-level square table arrangement shown in the images below, which they started off by pinning bun moss on to oasis. Then they added hydrangea, sunflowers, craspedia, fragrant Norma Jean roses, scented Vitality roses and peonies. 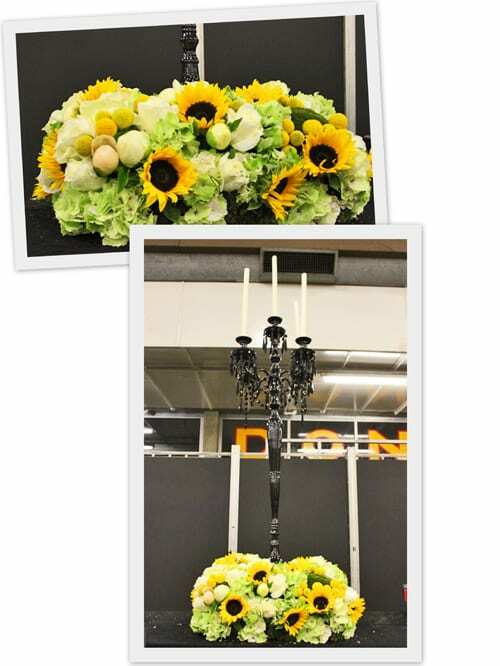 A tall black candelabra was then placed in the centre of the arrangement. When asked about wedding floristry trends, Victoria said that a vintage feel is often requested. For example, tables decorated with a hotch potch of either vintage glassware or tea cups. They also said that lots of inspiration from their brides is coming from the US. They too mentioned Style Me Pretty and also Martha Stewart Weddings. Interestingly, they said that US brides tend to use more plants. For example, begonia leaves and clematis. Craspedia is also very popular, especially for buttonholes. Blogging and tweeting were mentioned again. And Simon highlighted how important it is for florists to embrace social media. Euphoric Flowers themselves are on Twitter and also have a blog. The event finished off with a photographic shoot. Florists had brought along bridal bouquets which they’d created to showcase exclusively summer flowers and foliage. Professional photographer, Julian Winslow, captured the designs and I understand the winning entries will be published in the next issue of Professional Florist magazine. I thought it was a fantastic event and SO inspirational for florists with heaps of tips and advice. 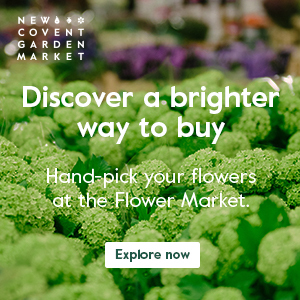 And if you’d like to keep up-to-date with news from the New Covent Garden Flower Market, they have a website and are on Twitter. Why not pop into your local florist shop today?